I know I mentioned this over a month ago, but for some reason it all felt so overwhelming to organize. But I want to do it! Originally, I was going to put up a list of books to vote on hoping that if we voted people would feel more invested, but instead I'm just listing some zombie books I'd like to read and hope people join in. If you don't, that's fine, too! By the way this is a TWD hiatus survival technique...plus I think the more shared zombie canon we have the more fun it will be to discuss the show. For May, since it's already May 10, the book is the Kindle Single, Don't Eat Cat by Jess Walter. It's only $.99 so it shouldn't break anyone's bank and anyone can download the Kindle reader for your computer or the free kindle app on your phone! I hope there are some of these the rest of you will want to read, as well! I really wanted September's book to be We're All Infected: Essays on AMC's the Walking Dead and the Fate of the Human, but it's $35 dollars and $18 to rent the Kindle version??? I really don't understand renting a Kindle book and paying that kind of money and I hope that's not a trend. In other zombie news! I've wondered for a long time why other networks didn't seize on the popularity of the zombie! I mean TWD is one of the most popular shows and it seemed strange to me that we didn't get a crop of poor imitations almost immediately..in fact the spin-off AMC is doing is the first one! But finally this year we do have some news of additional zombie shows about to hit our airwaves, yay. 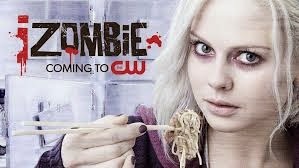 iZombie is based on the DC Comics title of the same name and centers on a medical student-turned-zombie (Rose McIver) who takes a job in the Coroner's Office in order to gain access to the brains she must reluctantly eat so that she can maintain her humanity. However, with every brain she eats, she inherits the corpse's memories. With the help of her medical examiner boss and a police detective, she solves homicide cases in order to quiet the disturbing voices in her head. Well, you know how I feel about thinking zombies. I don't particularly like them. I'll still give this a go, though, because trying everything is sort of my MO. But ugh, a zombie procedural? I mean REALLY? Z Nation is set three years after the zombie virus has gutted the country, and a team of everyday heroes must transport the only known survivor of the plague from New York to California, where the last functioning viral lab waits for his blood. Although the antibodies he carries are the world’s last, best hope for a vaccine, he hides a dark secret that threatens them all.With humankind’s survival at stake, the ragtag band embarks on a journey of survival across three thousand miles of rusted-out post-apocalyptic America. This one sounds more promising, but I almost never like Syfy shows, sigh. Anyway! Hope you are all surviving the TWD hiatus and that some of you will read these books with me :) Oh by the way all the amazon links on this page are affiliate links, so if you click and happen to buy something I might earn a small commission.